Sophie Gray, A.K.A. Destitute Gourmet, is one clever cookie. She has written several cookbooks full of wonderful recipes that are inexpensive to make, with her latest, 100+ Tasty $10 Meals, due out 1 April. 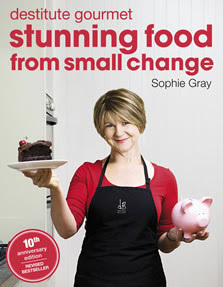 Her first recipe book Stunning Food from Small Change has just been relaunched with new recipes and a new look. Sophie has got lots of tricks up her sleeve - like only using one expensive ingredient per meal to flash things up, or using less meat in a meal by bulking it out with other ingredients. Her recipe books are full of these tricks, helping home cooks get more bang for their buck. I can always count on Sophie to have well explained recipes that will taste good and look even better. 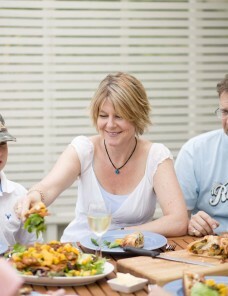 Sophie runs regular cooking classes all over New Zealand. She's a Christian so often gets booked by churches for fundraisers and ladies evenings. Sophie also puts out a regular e-newsletter and has a Facebook page. So far I've posted her recipes for Scottish breakfast pancakes and Stirfry beef and broccoli with cashews to this site, and more recipes will soon follow. If you haven't checked out Destitute Gourmet before, I highly recommend you do. You can buy her books direct from her website, or from Whitcoulls or Paperplus. Check out my review of 100+ Tasty $10 Meals here.